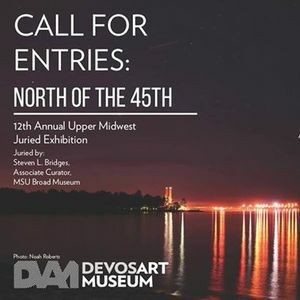 Eligibility: Open to all residents of Michigan, Minnesota, and Wisconsin living north of the 45th parallel. There is wiggle room for people within 1 degree of this area, but the idea is to represent artists living in the upper Midwest region. Work from all media is welcome and there are no size limitations. Work previously exhibited at the museum is not eligible. Submissions: All entries must be submitted by creating an account at devos.slideroom.com. There is a $20 fee to submit up to five images; the juror will select specific pieces for the exhibition based on these submissions. 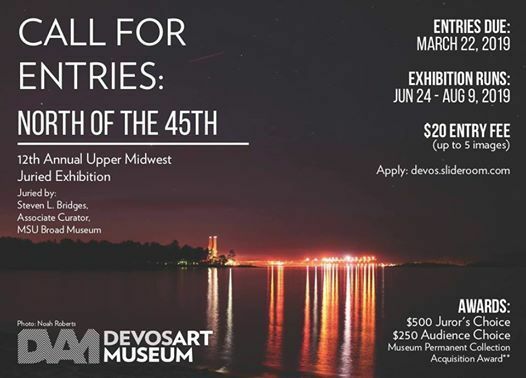 • A Juror’s Choice award will be selected by the juror, with a prize of $500. The recipient will also receive a one-on-one portfolio review with the juror. • An Audience Choice award in the amount of $250 will be given at the close of the exhibition, based on votes by visitors to the exhibition. **Accepted entries will need to be shipped or delivered to the museum ready to display. Paid shipping label for artwork return must be included with shipped work. Artists who hand-deliver their work can take it after the reception or pick it up between 12-6 pm on August 10 & 11. About the Juror: Steven L. Bridges is Associate Curator at the Eli and Edythe Broad Art Museum at Michigan State University. Most recently, Bridges curated the major exhibition Oscar Tuazon: Water School, and co-curated the exhibitions Michel Parmentier and Michigan Stories: Mike Kelley and Jim Shaw. Other notable projects include Beyond Streaming: A Sound Mural for Flint, a residency and exhibition for which artist Jan Tichy was invited to respond to the Flint water crisis. Previously, Bridges was the Curatorial Assistant at the MCA Chicago where he curated solo exhibitions of the work of artists Faheem Majeed and Jason Lazarus. He also assisted the major retrospective exhibition of the work of Doris Salcedo, which traveled to the Solomon R. Guggenheim Museum in New York and the Pérez Art Museum Miami. From 2011–15, Bridges co-curated the annual Rapid Pulse International Performance Art Festival in Chicago. His essays and articles have been published in numerous journals and in exhibition catalogues and other online and print media. In 2017 he was named a curatorial fellow at the FACE Foundation.